Today was a tough trading day for the bulls. No other way to put it. The market opened weak and couldn’t find a bid — first tell. As we traded lower there was no reflexive bounce off any technical levels and a noticable lack of buy programs all day — second tell. Couple that with big volume and the market behaved like a one sided all-day sell program. The third tell is the one I want to focus on. Each day as we approach the close I calculate and broadcast the NYSE imbalances. These numbers are important. For the last few days we’ve been getting the same old boring medium-sized buy imbalances. Today was totally different. Today, the market tipped its hand. 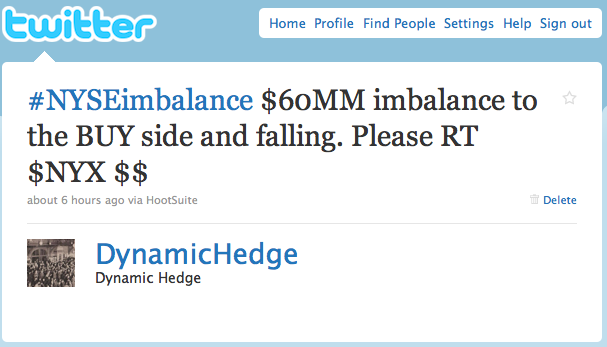 At 3:45 ET we got our imbalance numbers — $60MM to the buy side and dropping. This number in and of itself is a non-event. $60 Million is a light bid at best. The fact that as soon as it was published sellers started whacking it down (dropping the imbalance) is important. What hapened next is very interesting. 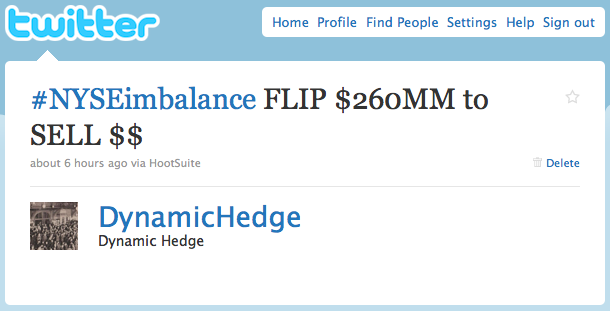 The imbalance flipped from $60MM to buy to $260MM to SELL. The important element here is that none of the initial sell imbalances got any bigger, but all of the stocks with buy imbalances got offset. Therein lies the rub. Professional traders were looking for liquidity to the sell side and they found it in any large cap stock with buy imbalances. Any blue chip with a bid got hit with size offsetting sell orders. I have no idea if it was funds adding to shorts, or longs stopping out positions on the close. All I know is that liquidity to the buy side got soaked up by eager sellers on down prints after trading 30+ S&P handles lower — Third tell. What does this mean? It means that the market had net sellers looking to sell more on a down close, which is a big deal. No one was in the market looking to buy stocks for a discount. The S&P futures went out with a wimper. It looks to me that the market wants to auction lower in the next few days looking for sell stops first and, ultimately, buyers. And then, guess what? It will auction higher! For those of us looking to actually trade this market, the message is simple, the numbers and levels you were keying off of today are no longer as valid as they were yesterday, so it’s time to switch up your game plan. This may seem obvious, but when the market gives you new information like this you have to listen and adjust.